Polyurea is an organic chemical compound, produced from the reaction of amine terminated polymer with isocyanate. Polyurea looks like a rubber or plastic compound. Since decades, polyurea has been used for lining and coating purpose. These coatings are flexible, durable and impact & corrosion resistant. Polyurea coatings are also used to waterproof the tanks, reservoirs, tunnel and parking garages. Global polyurea coatings market is anticipated to flourish at a CAGR of 12.7% during the forecast period 2017-2024. Further, the polyurea market is expected to garner 1.3 Billion by the end of 2024. Wide scale application of polyurea coatings in construction and industrial sector is driving the growth of the global polyurea market. Asia Pacific is expected to showcase lucrative growth and is likely to make significant contribution to the global polyurea coatings market. Moreover, Asia Pacific polyurea coatings market is projected to grow at highest CAGR during the forecast period. Rapid development and growth of industries and real estate is expected to fuel the growth of polyurea coatings market in the Asia Pacific region. On the basis of raw material, global polyurea coating market is segmented into aromatic isocyanate based polyurea coating and aliphatic isocyanate based polyurea coating segment. Aromatic isocyanate based polyurea coating segment accounted for the largest share in overall polyurea coatings market. However, aliphatic isocyanate based polyurea coating is expected to propel at a higher CAGR than aromatic isocyanate based polyurea coating. Rising adoption of polyurea coatings due to its high strength, long life and waterproof features is expected to drive the growth of the global polyurea coating market. 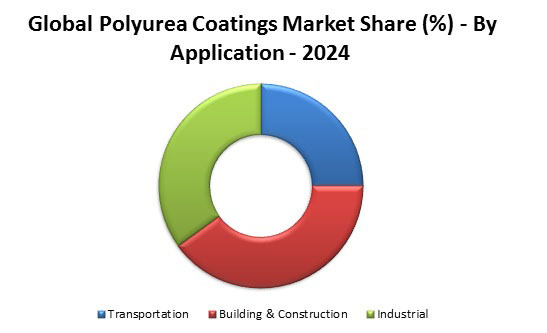 Additionally, increasing application of polyurea coatings in aerospace, automotive, infrastructure and oil & gas industries is predicted to trigger the growth of global polyurea coatings market. 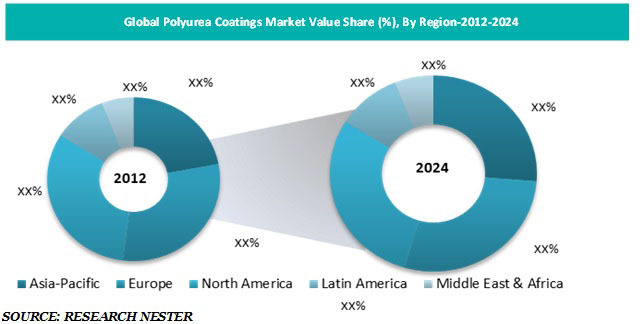 Apart from this, high investment in infrastructure sector in developing regions is envisioned to bolster the growth of global polyurea coatings market. Rising inclination of the population towards environment friendly products is growing the demand for polyurea coatings. Polyurea coatings are environment friendly as they do not contain volatile organic compounds (VOC’s). Further, polyurea coatings are available with anti-microbial agents which prevent the product from degrading. These are the some of the factors which are fuelling the demand for polyurea coatings across the globe. In contrast, high cost of polyurea sprayer and equipment is expected to inhibit the growth of global polyurea market. Further, availability of cheaper alternatives such as expoxies is anticipated to limit the growth of global polyurea market.